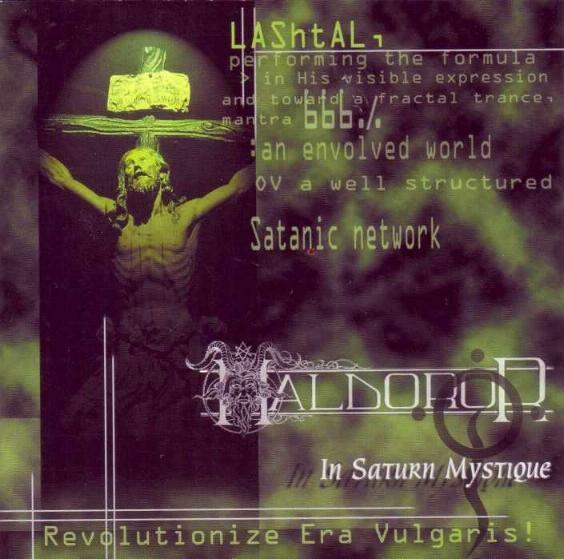 Maldoror where a band from Italy that played an occult form of black metal and this is a review of their 2000 album "In Saturn Mystique" which was re-issued in 2016 by Rude Awakening Records. Melodic Gregorian chants and keyboards start off the album and after the intro the music starts getting more heavy and melodic while also keeping the keys and adding in high pitched black metal screams and the solos and leads also use a great amount of melody and most of the tracks are very long and epic in length. Ritualistic spoken word parts can also be heard at times and all of the musical instruments have a very powerful sound to t hem and death metal growls are also used at times and when the music speeds up a decent amount of blast beats can be heard and the music has a style that was very common during the mid 90's and tremolo picking can be heard in some of the faster riffing and there is also a brief use of industrial elements on a couple of songs. Maldoror played a keyboard orientated style of black metal that was very common in the 90's while also being more ritualistic, the production sounds very powerful for the era it was recorded while the lyrics cover Occultism and Esoteric themes. In my opinion Maldoror where a very great sounding keyboard orientated occult black metal band and if you are a fan of this musical genre, you should check out this re-issue. RECOMMENDED TRACKS INCLUDE "E.O.N Mysterium" "Osiris Elettro Mantrum" and "Hod". 8 out of 10.